Echomac® 25mm Ultrasonic Rotary Test Unit for high speed precision testing of small diameter, thin wall tube. Magnetic Analysis Corp. has just received customer pre-acceptance on its latest Ultrasonic Rotary Tester, the Echomac® 25mm. Designed for high speed flaw and dimensional ultrasonic inspection of tube in high precision applications, the Echomac 25mm Rotary provides 100% coverage at high throughput rates on thin wall product ranging from 5 to 25mm diameter. This 25mm Rotary is especially well suited for challenging applications requiring high performance such as tubular product for nuclear and aerospace installations. The 630mm overall length of the Rotary allows for ease of installation when upgrading existing inspection lines. Wall thickness as thin as 0.3mm and tubes as short as 1 meter can be successfully tested. Features include a transformer design which ensures improved signal to noise ratio, enhanced bandwidth, zero channel cross-talk, 8,000 RPM running speed, precision test blocks and transducer holders, convenient adjustment of the transducer angle, and optimum operating safety. The 25mm Rotary joins MAC’s line of UT Rotaries which range up to 500mm capacity. 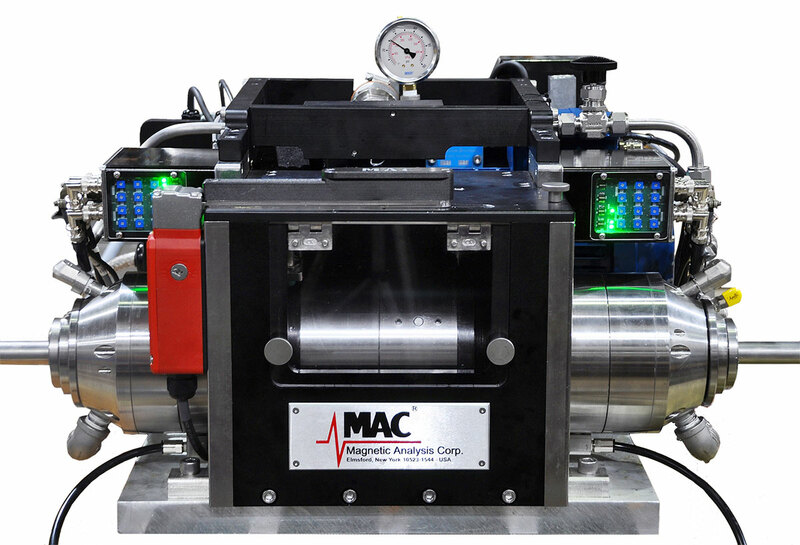 When used with MAC’s Echomac FD-6/6A instrumentation, the Rotary system provides outstanding inspection of ID/OD, longitudinal and transverse flaws, wall thickness and dimensional evaluation including conditions of eccentricity and ovality. The Echomac FD-6/6A achieves a high signal to noise ratio, includes a wide range of selectable band pass filter settings, precise thickness resolution (1 μm) and excellent repeatability and reliability. Features include Echohunter® software which provides a versatile, intuitive operation with convenient set up and control of all key test parameters on one screen, the ability to move thresholds by selecting and dragging on screen, and a global key to adjust or copy a group of test parameters from one channel to another. The Model 6A also holds GE Qualification for P3TF31 and P29TF82 Class A and B, typically required to meet high level quality standards for aerospace and other critical applications. The Echomac® series is being used for a variety of applications ranging from full body testing of spinning tube and weld zone inspection during production, to 500mm Ultrasonic/Flux Leakage multi test systems for large diameter OCTG pipe.